Well this bull market just won't seem to let up and our net worth has seen a fairly substantial increase since my last update. 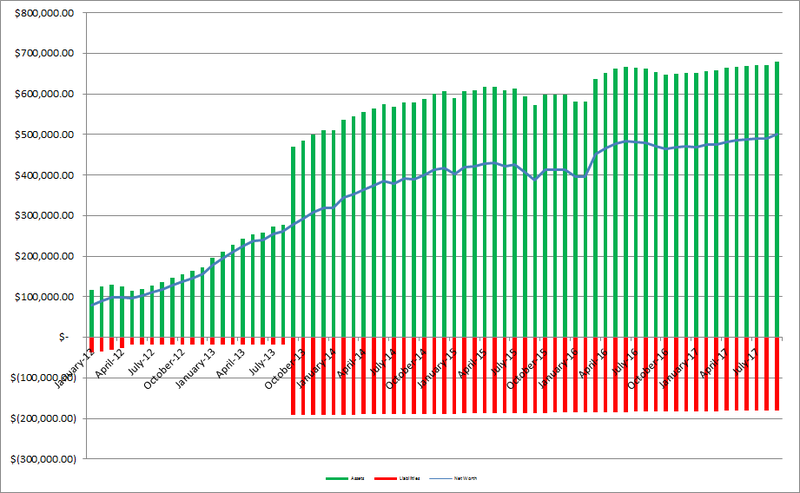 At the end of April my net worth sat at $482,747.35 and through the end of September it's climbed another $17,651.48. That pushes my net worth over the...drumroll........$500k mark! Milestone! 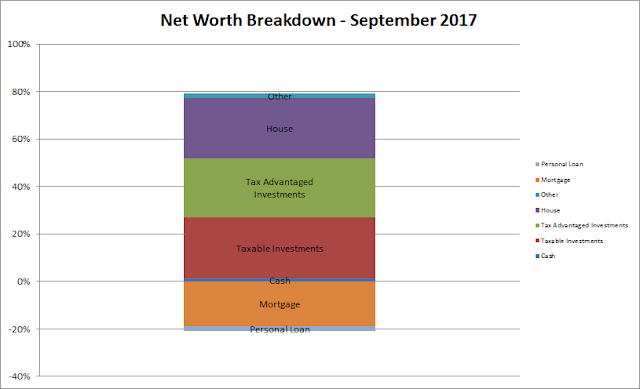 During September alone my net worth increased $9,429.40. It's been a pretty amazing journey to reach the $0.500 MM mark, somehow it seems like a bigger number when you reference millions. 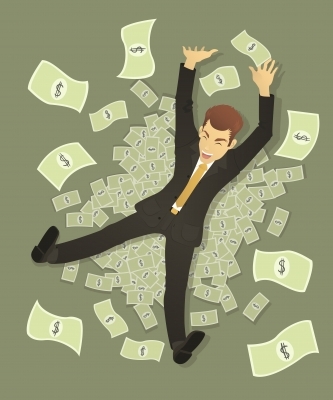 When I started keeping track of my finances back in July 2010 my net worth was a -$1,663.30. Yikes! The combination of high income and high savings rate really helped to propel my net worth firmly into positive territory. We've stalled out a bit over the last couple years due to my wife quitting her job while we dealt with all of the issues with our son, then me getting laid off, then her getting a new job while I stayed home with our daughter and then finally we returned back to a two income family earlier this year. Unfortunately we were cash flow negative/breaking even for a majority of that time which meant there was no savings to be seen let alone invested. Overall though I can't really complain because the bull market has powered our net worth higher despite our lack of additional savings. We still have some debt to work through over the next 6 months or so, but a return to regular investing will be very much welcomed. As of the end of September we have 25.4% equity in our house based on our purchase price from 2013. However, according to Zillow our house has increased in value just over $35k from our purchase price which is a nice bonus, although I keep the purchase price as the value in the net worth equations. Based on Zillow's estimate the equity in our house is 35.7% thanks to the appreciation. Since I write so much about investigating companies as an investment I figured it'd be fun to see how our balance sheet looks. As of the end of September our debt to equity ratio is 35% and our debt to total capitalization is 21%. Not bad, but I'd love to get that debt down to ZERO! Truly passive income, dividends and interest, totaled $906.75 during September which was about a $16 increase from June of this year. *Dividends are from my taxable accounts only. Adding in the EBIT earned from blogging/writing added another $107.07 to the monthly non-day job income total. 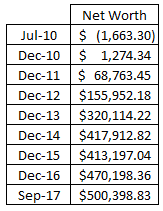 Total non-day job income for September came to $1,013.82. Comma month!!! BOOM!!! Half a Mill!! You have HALF A MILL!!! Congratulations and what a milestone!! It was awesome to see the $500k mark finally come up. We crossed that assets wise a while back but our net worth was well behind due to our mortgage, but this bull run just keeps on going. Eventually it'll turn but hopefully it can keep going until we get the majority of our non-mortgage debt paid off and can get back to investing. A big congratulations to you, and thank you for sharing the post about your son. That is so heartbreaking, and I want to wish you guys all the best and much love. Congratulations for your daughter and God bless. Congrats on crossing the $500k mark. Such an accomplishment given everything that you have gone through recently. The post your wrote on your linked page is beautiful and I can't even imagine what you and your went through. I'm looking forward to many future updates about your net worth! Congrats on hitting $500K net worth, that is a huge milestone and job well done. Can't wait that milestone some day, although that's a long way out for me though. Congratulations for your daughter and God bless. Congrats, that's an awesome milestone. The one million mark will come a lot faster now with all of the compounding!